There are three main reasons that most people would find building core strength to be desirable: athletic performance, prevention or relief of back pain, and vanity. Let’s suppose that you are motivated by all three of these factors, prioritized in an order decided by what motivates you most as an individual. For the sake of this article, it is somewhat irrelevant as to why you want to build core strength, I’m going to focus more on how. However, I will assume that all of these benefits are important and not assume anyone wants a “ripped six pack” at the expense of spine and organ health. In other words, I am talking about the core in it’s entirety, not just the phasic muscles that are often targeted in isolation exercises. The muscles of the core can be viewed as two somewhat separate systems that must work together in even the smallest interaction between you and the physical world. The deep inner unit provides a stable foundation for the superficial outer unit to work from. When you are moving your body, lifting objects, stabilizing, balancing, and interacting with gravity on a daily basis, these muscles should be constantly communicating to enable your activity. Think of running on a hard surface, every new step is assisted by the last, the elastic tension in your muscles acting like a spring to propel you forward. 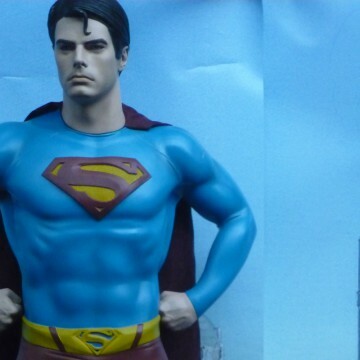 Now, compare it to running in sand, the elastic tension is lost, absorbed by the soft surface on which you were moving. Your core works the exact same way, however, there is something more to consider. Your core muscles provide protection for your spinal cord as well as your internal organs and every time that metaphorical foot sinks into the sand, the energy is going somewhere it shouldn’t. 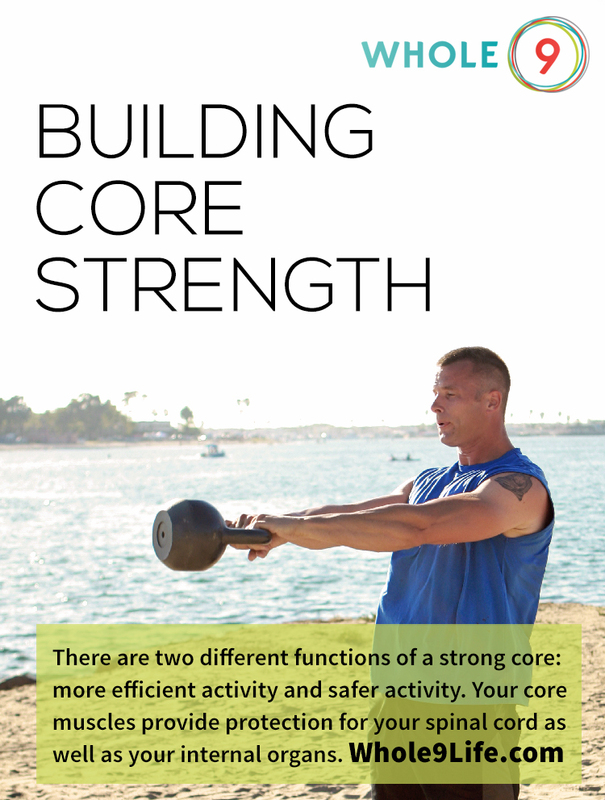 This analogy points to two different functions of a strong core: more efficient activity and safer activity. If a chain is only as strong as it’s weakest link, targeting the abs and obliques in exercise isn’t likely to increase your overall strength. However, it is likely to put excess stress on the weaker links in normal activity, causing bad posture and back pain. When you sit or lay down, the deep muscles that stabilize your pelvis throughout normal movement are temporarily turned off. If your goal is to function better when interacting with the real world, don’t exercise your core this way, at least not habitually and primarily. Seated ab machines, sit-ups, crunches and the like will not only create an imbalance in core strength they also lead to poor posture. Rounding of the spine, forward head and protracted shoulders are a common issue caused by these exercises. In order to build proper core strength you need to be interacting with gravity in the same way you would when using core strength in the real world. A recent study by ACE (American Council on Exercise) showed a seventy percent improvement in core strength in people who participated in two kettlebell classes per week for eight weeks. That’s pretty drastic, an improvement like that would be more than sufficient for most people to at least rid themselves of existing pain in as little as eight weeks with such a minimal time commitment. After a decade of teaching the art of kettlebell training, I can tell you that doesn’t mean you should just go buy a kettlebell and start swinging it today. Before you begin lifting anything it’s important to make sure that your deep stabilizers are going to be up to the task ahead. I am not able to tell you specifically what your starting point is because it is so very unique to the individual. Even describing all of the various ways a weak core can manifest itself is beyond the scope of this article, all I can tell you is that your ability to develop core strength will be completely and utterly dependent on your ability to learn your body. For some, their journey to building core stability will begin with breathing and bracing techniques performed while standing with no weight. Observe how the engagement of the deep pelvic floor muscles activate the abdomen and the transverse abdominus, nature’s weight belt. Simple exercises such as bracing while standing and then bracing while standing on one leg can often help as you learn to use the various systems of the inner and outer unit. As you progress into resistance training, the deadlift will be the foundation of your development of core strength. Nothing in the gym relates to real world activity quite like picking something up off the floor, using your legs not your back. Exercises like the standing cable row condition the anterior and lateral systems as well as your posterior oblique system. Progress this into a hip extend with cable row and the challenge increases, as does your potential. A standing cable press requires the anterior oblique system to stabilize the leg and trunk to facilitate the movement at the shoulder. These are some very basic ways you can begin creating strength in the muscles that stabilize the spine and support your internal organs that directly relate to the real world. When you reach the point where you believe your deep stabilizers are at least as capable as the muscles around them, you will be able to increase the demand you place on your kinetic chain as a whole. 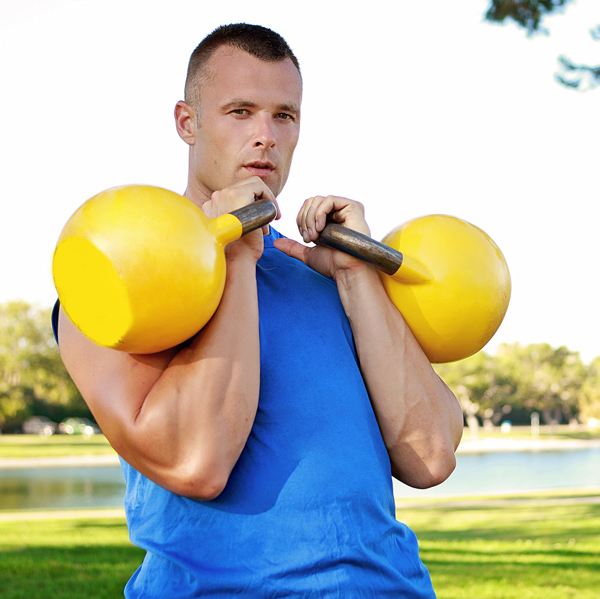 The kettlebell swing is certainly one of the first and most significant steps for a bullet proof midsection. The swing takes the strength phase deadlift and turns it into the power phase. The power phase is a vital part of your practice, as it is used all the time in everyday life. From throwing to jumping or even catching yourself from a fall and decelerating your momentum, the power phase is a constant. Not only will this progression in your practice develop strength everywhere else, it will train your deep inner unit and superficial outer unit like nothing before. Core strength is often limited to your flexibility in your hips. To make matters worse, the weaker your core becomes, the tighter your hips will become. If you have an anterior pelvic tilt (pelvis lower in the front than in the back) you will have to implement an intelligent lengthening and strengthening strategy before you progress very far. This isn’t the only sign of hip tightness mind you, but it is extremely common. One leg exercises require contraction of the glutes, and adductors as well as deep lateral core muscles to stabilize the pelvis. Use your imagination and progress the exercises in your routine to one leg variations when you can. Use all three muscle phases: static, strength and power in your training. Practice the basics diligently before progressing. The power phase lifts and movements that accelerate during the concentric phase will demand a deeper level of engagement from your core, and usually are accompanied by a point of deceleration, another fantastic strength builder. Overhead weight lifting while standing, squatting or lunging can be a fantastic way of altering and increasing the demand on your core during exercise. The turkish getup is an example of moving under overhead weight. Overhead squats and windmills are also an example of this. All overhead exercises require a certain degree of shoulder flexibility to perform safely. Rotational strength and range of motion is often overlooked and yet highly important for good posture and functional ability. Use cables to put a lateral load on your body and perform variations of wood chops. Also, learn to use proper rotation in combination with pushing and pulling exercises. Remember, if your goal is to get rid of the fat that seems to want to linger on your tummy, diet and smart exercise is the answer. Targeting specific muscles doesn’t burn the fat in that area, so train your entire chain! This video is a teaching on how to use your core properly when swinging a kettlebell. When you are ready for this exercise, please observe your technique and make sure it is correct. I am pulling from the most common issues I have seen over the past ten years. I often work with people for months before they are consistent with this move. When you get the technique correct and combine it with smart training and recovery, you will see unbelievable and immediate changes in your core. Great article! Strengthening your core will help all those activities you want to do :) And I love that you mentioned hip flexibility as well. Focusing on that is a great supplement to a workout. A good dynamic warm up and cool down will help expand those ranges and keep you from getting injured! Thank you so much! This video was unbelievably helpful in getting me to finally understand the common problem of the anterior pelvic tilt! It was so easy to understand coupled with the demonstration of a improper/proper kettlebell swing. Thanks again!